I'm not one for hunting safaris; all that walking and killing. But a good questionably-endangered wild cat meat product, purchasable from the safety of my local first world market, is almost impossible not to notice. 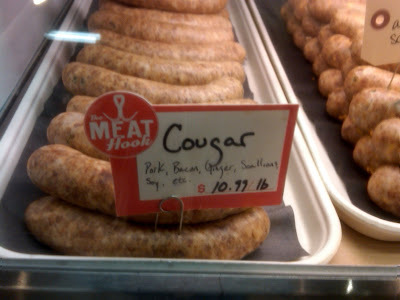 Walking by the The Meat Hook butcher display case the other day, they had probably the most phenomenally titled sausages- Cougar! I stopped, but my mind was moving approximately 50 mph (actual cougar speed). I imagine this is what hunters experience when they finally set eyes on their prey. 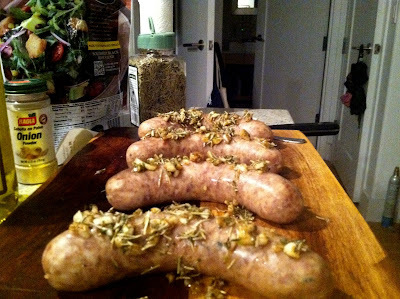 As it turns out, the sausages were made from pork, bacon, ginger and scallions (and exactly zero cougar). But I'd been won over. I brought the cougs home, and dressed them in a delightful number consisting of garlic, rosemary, kosher salt, olive oil and pepper. Then I brought the bbq up to about 250 and let them smoke for approximately 30 minutes. The combination of ginger and bacon is something you need to get on immediately. While downing the cougs, I had a chance to look up whether authentic cougar sausages actually exist. 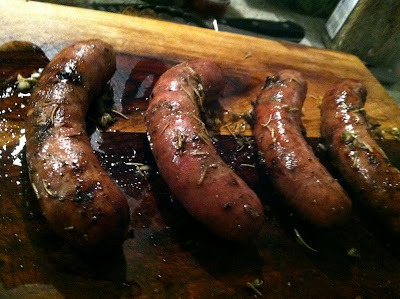 Dean M, frequent forum contributor at Huntingbc.ca, had this to say on the matter: "I ate Cougar sausage ONCE, Tasted like what wet dog hide smells like!!! Cat is Cat, if the lord wanted us to eat them, he would have named them COWGAR!!!" Right on Dean. Right on. PS Don't eat endangered animals. Not mentioning any names, DEAN.